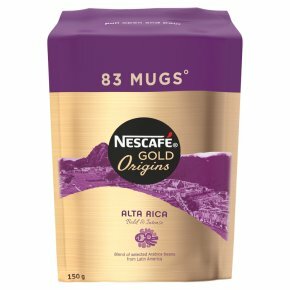 NESCAFE Alta Rica - Our darkest NESCAFE roast; a bold coffee with a distinctive flavour - Made with 100% Arabica coffee beans from Latin America - Part of the NESCAFE Collection family - Top up your jar of coffee from this handy, light and compact 150g pack! Easily top up your coffee jar with this convenient refill pack. Stir your senses with NESCAFÉ GOLD ORIGINS Alta Rica instant coffee. A premium deliciously dark roast instant coffee for an intense experience. Crafted with 100% Arabica coffee beans from Latin America. Grown respectfully; sustainably sourced & selected by local farmers. Delight your senses with NESCAFÉ GOLD ORIGINS Alta Rica. This premium instant coffee is made using dark-roasted, pure Arabica beans from Latin America for a delicious coffee with a distinctive, intense flavour. A bold drinking experience with a surprisingly smooth cacao finish.